There are two types of almond (sweet and bitter), but we use the sweet one. The almond is a fruit and a part of the plum family. The tree is a medium-sized tree, native to the Middle East and North Africa. Its white blossom is captivating and beautiful, inspiring many legends. Ancient Egyptians valued the almond for cosmetic purposes. The ancient Greeks and Romans used to eat almonds to counter the effect of alcohol. 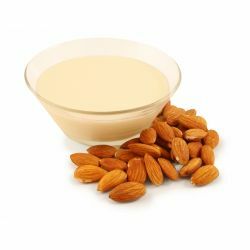 When crushed and infused in water, almonds yield lovely milk, which is created as the almond oil combines with the water. Traditionally, almond milk was used as a drink to treat inflammation of the skin from the inside out. Our almonds originate in the warmth of California, one of the largest almond growing areas in the world. The almonds themselves have to undergo several different processes. They are shelled and sorted into groups of those suitable enough to become oil. They are processed into crude oil and different grades of refined oil are then produced. Almond crops are very susceptible to weather, achieving larger quantities in sunny climates. The trees don't produce almonds for the first three or four years of their lives and will be productive until around twenty-five years. To produce the almonds, the flowers need to be pollinated and many of the producers keep beehives to encourage this. Almond milk is excellent when used to soften and moisturize. We use almond milk in our Celestial skin cream for just this purpose; it makes the skin feel beautifully soft and nourished.